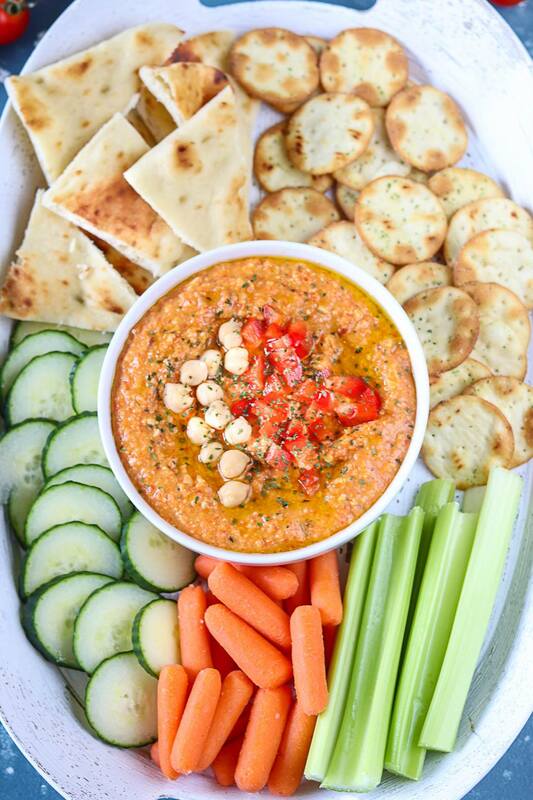 Dig into this homemade Roasted Red Bell Pepper Hummus that is fully loaded with healthy and nutritious ingredients. This creamy hummus comes together in less than 30 minutes and is great for year-round entertaining! Whether it be a game day, potluck or picnic, hummus is one of the BEST and easy appetizers to make. 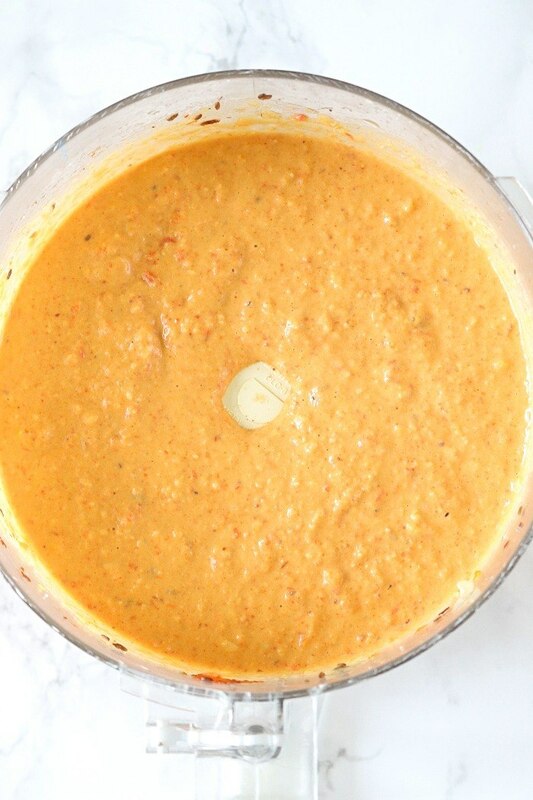 And for my upcoming dinner, I plan to serve this amazingly delicious starter – Roasted Red Bell Pepper And Chickpea Hummus to my guests. This rich and creamy hummus is an excellent alternative to the traditional hummus, and you will be addicted to it in no time. At least I am addicted to hummus. It’s one of my favorites, and you will always find a small container of homemade hummus in my refrigerator. I can have it any time of the day with fresh veggies, crackers, and crusty bread. 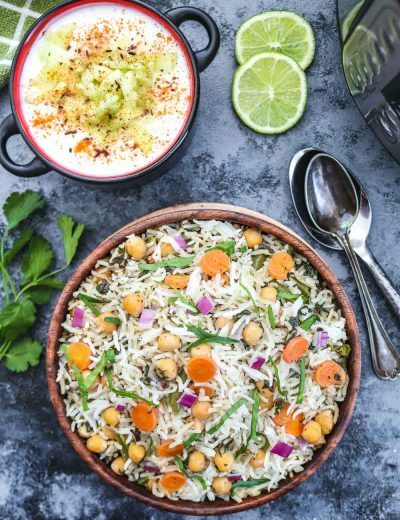 Best part this recipe comes together in no time and is made with healthy feel-good ingredients. HOW IS THIS ROASTED RED BELL PEPPER HUMMUS HEALTHY? 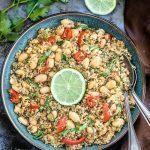 Chickpeas – these protein-rich legumes are an excellent source of protein, folate, dietary fiber, complex carbohydrates, iron, and zinc. Red Bell pepper – these sweet peppers are rich in vitamins and antioxidants. Cashews – these nuts are rich in vitamins and a good source of magnesium and zinc. 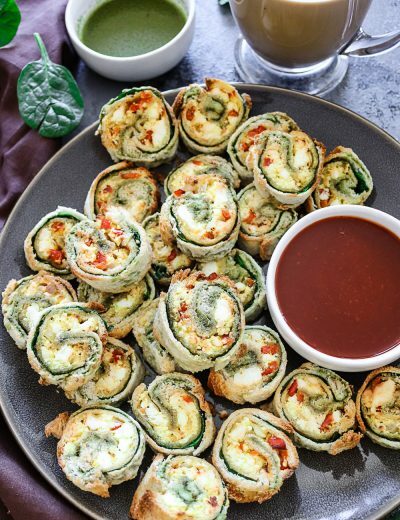 Overall a stunning hors d’oeuvres packed with healthy stuff. HOW TO MAKE ROASTED RED PEPPER AND CHICKPEA HUMMUS? This hummus is relatively easy to make. It is different from the traditional hummus because it contains – roasted red bell peppers and cashews. Instead of tahini, I have used soaked cashews. Soaked cashews give a unique texture and creamy consistency to this hummus. 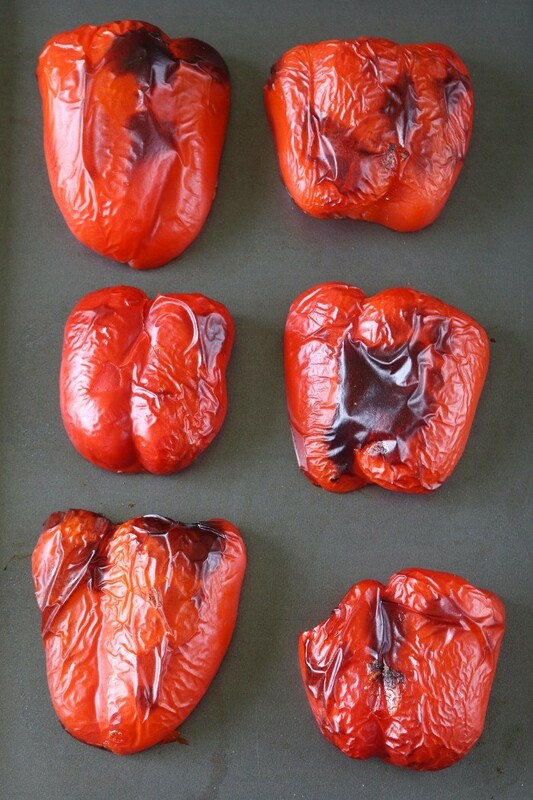 Start by roasting the red peppers halves in a preheated oven until soft and slightly charred. Remove the charred bell peppers from the oven and allow it to cool. Remove the excess charred skin and allow it to cool. Roasting brings out the peppers earthy and smoky flavor and adds vibrant color and beautiful flair to this hummus. In a nutshell, roasted bell peppers elevate the overall taste and take this hummus to a whole new level. Transfer the fragrant charred peppers to a food processor. 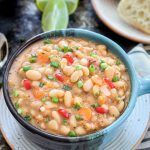 Combine with all the other ingredients and pulse until smooth and creamy in texture. Pulsed hummus will have a thick paste-like consistency. That’s it; you are all set! Red Bell Peppers add moisture and a sweet peppery taste, and the chipotle pepper lends a robust flavor. Altogether, this hummus is rustic in texture. 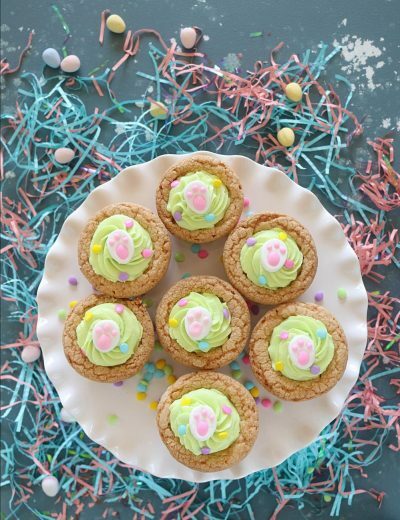 This recipe is highly addictive and is sure to please all of your party guests! HOW TO SERVE ROASTED RED PEPPER AND CHICKPEA HUMMUS? Place the hummus in a serving bowl. Finish it off with chopped tomatoes, few chickpeas and drizzle a little extra virgin olive oil on top. Arrange the hummus in a platter and make a pretty presentation by circling your hummus with fresh veggies, crackers, and toasted pita bread. Or eat it just as is! Another option is to layer your sandwiches or burger with this hummus. Wash and pat dry the bell peppers. Remove the stem, the core and cut them in halves. Discard the seeds. Preheat the oven to 400 degrees F.
Place the bell peppers on a baking tray and roast in the preheated oven until blistery and soft. It will take about 10-15 minutes. Remove from oven and let it cool. Peel and discard the extremely charred skin of bell peppers. 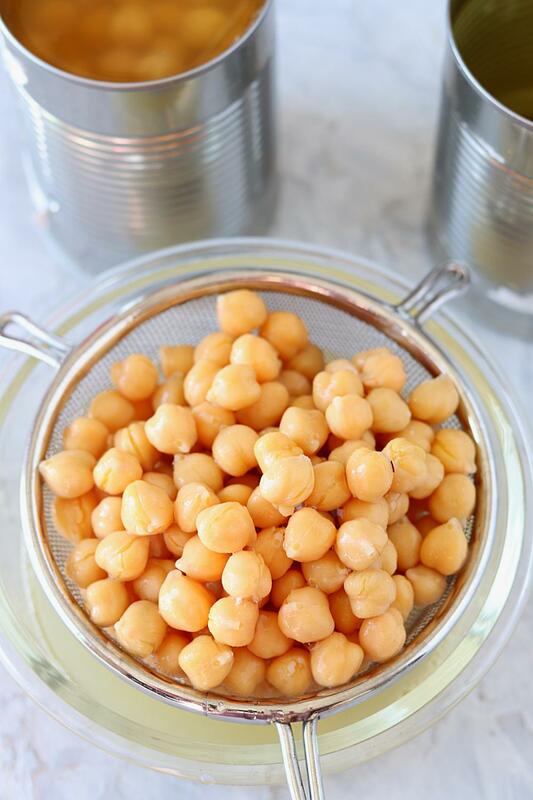 If using canned chickpeas, drain and rinse them thoroughly. Combine roasted peppers, onions, chickpeas, chipotle peppers, cashews, lemon juice, garlic and spices in the food processor. While the processor is running, add the olive oil slowly and blend until combined. This slow addition of olive oil will smoothen out the hummus. Pulse the ingredients for about a minute or until smooth. If the mixture seems too thick, then add a tablespoon of water and blend until desired consistency is attained. Taste the seasoning and adjust accordingly. Transfer the hummus to a serving bowl and chill before stirring. Hummus will become firm as it chills. Garnish with chopped tomatoes, olive oil, and cilantro leaves. Goes well with pita bread, crackers, cucumbers, carrots, and celery. 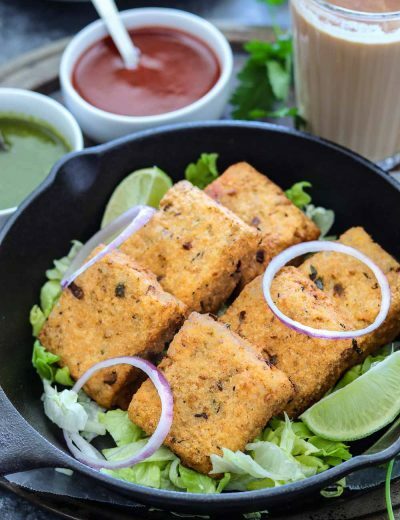 This recipe can be efficiently adapted to suit your taste. E.g. You can leave out the chipotle pepper if you don't like a spicy hummus. Cashews can be swapped with tahini. Instead of canned chickpeas, you can use dried raw chickpeas. For that -soak the chickpeas overnight. In the morning, boil the chickpeas for 50-60 minutes until tender and soft. I prefer my hummus with some texture. Therefore, I keep the chickpea skins on. But for a much smoother texture, peel the skins off the chickpeas before adding them to the food processor. Roasting bell peppers doesn't take that long. But to save time, you can always use store-bought roasted bell peppers. This recipe makes a large batch. So if it can't be consumed the same day, no worries. This hummus can be stored in the freezer for up to 3 months in an airtight container. - How long this hummus stores well in the refrigerator? Leftovers will stay good for up to 3 days in the refrigerator. How much tahini and lemon juice ? Cherry, I have updated the recipe and for Tahini, please use 1/4 cup as a replacement to cashews.